At the time of its occurrence there was no doubt of the murders having been planned and carried out by McDermot, he acting on Grace Marks’ pliable nature to secure her as an assistant and an abettor in carrying out his diabolical intentions he had been thinking of, until he resolved to obtain his master’s money. Capt. Kinnear had financial business in the city of Toronto every week. He had gone as usual and was expected home on Saturday evening with a large sum of money drawn from the bank. McDermot resolved to get possession of that money. Whatever hindrance there was in the way must be removed. The first impediment he had to encounter was the housekeeper. Acting on Grace Marks’ growing dislike to Nancy, he secured her acquiescence in his evil designs. An open attack would be a dangerous venture. On Friday after tea the evening was spent in merriment and fun. The Captain’s larder was drawn on for wine and stronger beverages. The conspirators saw that their intended victim got a good supply, the effects of which soon became apparent. Playfully they placed a long twisted towel around her neck. Each pulled until Nancy fell a strangled woman. While warm and limp, the two dragged and threw the body down the cellar, descended and pressed it into a large meat tub, turning the tub upside down. Col. David Bridgford long ago deceased, the day after the murders were discovered picked up the towel and took it to his home. It was placed on a tree in the orchard where it hung until the wind blew it to threads. Having got rid of the housekeeper, their next objective was to dispose of the master. 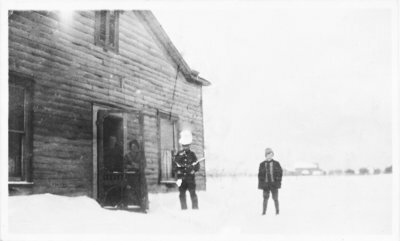 Immediately opposite the Kinnear residence on the Newberry farm, was a small log house occupied by a man named Harvey, whose lad worked at our home. On Saturday morning McDermot went over and asked the loan of Harvey’s double-barreled gun to shoot pigeons with. The woman refused because the owner was not at home. The gun was on two pegs on the opposite wall. McDermot walked in and took it down and passed out. In the evening, somewhat late, the Captain returned from the City. Driving to the stable he left the horse and went to the house to inform his man. McDermot met him as he came in at the door and fired. The bolt went through his heart and lodged in the skin of his back. He staggered and fell, exclaiming, “Oh my God, I am shot!” On Grace Marks expressing her horror at the deed, McDermot immediately pointed the gun at her and fired again, saying “If you ever tell, your life will not be worth a straw.” The ball missed the girl and lodged in the sill of the porch, where after the extraction of the bullet the mark was shown for many years. The body of the murdered man was dragged to the door of the cellar and thrown down. Taking what money they could find much disappointed in the amount, the Captain’s horse was hitched to his new buggy and the guilty pair commenced their flight, hoping to reach the States before being overtaken. On Sunday afternoon, Mr. Jas. Newton Sr., and Captain Francis Boyd, near neighbours and intimate friends of Mr. Kinnear, made a call and discovered evident signs of an awful tragedy, for in their haste the perpetrators of the crimes had left the premises in the utmost disorder. The Captain’s body was easily found, but hours were spent in the search for that of the housekeeper. In looking again through the cellar, after several fruitless attempts, someone accidentally turned over the meat tub, revealing the body of the dead woman. In the meantime McDermot and his companion had made their way to Toronto. On Sunday afternoon, Mr. F. C. Capreol, a friend of Mr. Kinnear, noticed the Captain’s travelling rig in town and suspected something wrong. On Monday morning he found McDermot and Grace Marks had taken a steamer to Lewiston. He at once engaged another steamer and with Mr. Kingsmill, the High Bailiff, left Toronto at 1 o’clock, and went in pursuit, landing at Lewistown, they soon got possession of both criminals.